History, Truth and a Point by Point Look at Occupy Wall Street’s ‘the 99 Percent Declaration’ (Part 2) | Virginia Right! In the first part of this 2 part series we looked at the history of Popular Movements of the 60’s and 70’s and how they were co-opted by the political left as a means to an end. 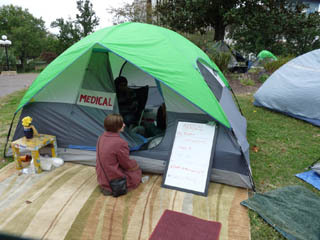 The article was a followup to an article written based on my visit to the Occupy Richmond on Friday. The Occupy movement is an interesting phenomenon which merits a closer look. It is interesting to me because I see parallels between those earlier movements and what is going on today. In particular, the co-opting and steering of the movement to assist the current president in his reelection. While people have had a tendency to look at the TEA Party movement as a single entity, those involved know that each one is autonomous and different. They all share a common desire to get back to the type of government our founders set up. But every group has different thoughts on how to achieve their goals. Some prefer local involvement and others are more national. There is no single leader and there are a number of opposing views on everything from candidates to things like social issues. Organizationally, the Occupy movement faces the same things, albeit from the opposite end of the political spectrum for the most part. What I have discovered is that it is inaccurate to assume that the people occupying Wall Street and the ones occupying Richmond are synonymous and united. For instance, Chris, the gentleman who kindly showed me around the camp at Kanawha Plaza said on the video that in order to pass a resolution through their General Assembly, 90% agreement is required. I don’t even agree with myself 90% of the time, although by default, I agree with my wife 110% of the time. Corporate influence has corrupted our government through lobbying and financial contributions. The ability of our government to work for the best interest of the people is failing. Occupy Richmond is a Social Justice movement dedicated to equal opportunity for all. All are welcome to join us. We are a group of individuals with our own personal agendas and different political ideologies who have come together now to share our grievances. Sorry my fellow right wing conservatives. I am at a loss to find fault with these points. As several Occupy Richmond participants have pointed out, this is all they have agreed upon. The 99% Declaration (which I will address shortly) is not an agreed upon item in Richmond. So there is clearly evidence that Occupy Richmond is an exception (perhaps the exception) to the unruly behavior seen at Occupy Wall Street. And clearly #OWS is a different breed of protest. This is a far left, union driven, agenda with room for all of the Socialist and One World Government view that is the Progressive Agenda. This should qualify the Wall Street group as a Hate Group. This is nothing more than a left wing Progressive manifesto full of ridiculous claims, accusations and assertions. Most of these people see Hugo Chavez and Fidel Castro as heroes and liberators. And this is what I expected to find in Richmond. And I did not. Now I am sure there are some who buy into this, but it should be obvious that the New York group is a far left wing gang of thugs and anarchists led by the former group known as ACORN and SEIU members. There is no doubt that this type of unsavory influence is working to corrupt Richmond, but I do not believe it has – yet. And those who are not part of the 23 point demands from #OWS are being mighty quiet. They are truly the pawns of the Progressives. Now, turning to “The 99% Declaration” the far left Socialist and Progressive agenda / influence is there, but the demands are somewhat more subdued. 1. Elimination of the Corporate State. Implementing an immediate ban on all private contributions of money and gifts, to all politicians in federal office, from individuals, corporations, “political action committees,” “super political action committees,” lobbyists, unions and all other private sources of money or thing of value to be replaced by the fair, equal and total public financing of all federal political campaigns. We categorically REJECT the concepts that corporations are persons or that money is equal to free speech because if that were so, then only the wealthiest people and corporations would have a voice. The complete elimination of private contributions must be enacted by law or Constitutional amendment because it has become clear that politicians in the United States cannot regulate themselves and have become the exclusive representatives of corporations, unions and the very wealthy who indirectly and directly spend vast sums of money on political campaigns to influence the candidates’ decisions when they attain office and ensure their reelection year after year. Our elected representatives spend far too much of their time fundraising for the next election rather than doing the People’s business. The current system’s propagation of legalized bribery and perpetual conflicts of interests has reduced our once great republican democracy to a greed driven corporatocracy run by boardroom oligarchs who represent .05 to 1% of the population but own 38% of the wealth and whose incomes have increased 275% since 1979. While I am glad (and a bit surprised) to see Unions are also on the wish list of those marked for silencing, the group is advocating for an elimination of the Corporate State by increasing the power of the government to police political speech. Sorry. If you can burn a flag as free speech, you are also within your rights to donate money to whatever group or person you wish. President Obama is planning to spend $1 Billion on his reelection bid, most of it from the wealthy. These people advocate spreading the wealth, but what actually happens to the money donated? It goes to radio and television stations who pay their employees. Print ads for the failing newspaper business, caterers, pilots, mechanics, sound people, light people, speech writers and virtually every segment of society. This is an examole of spreading the wealth the Capitalist way. And while the incomes of the wealthy may have increased 275% in the past 3 decades, the minimum wage has gone up 250% since 1979. Where’s the beef? 2. Rejection of the Citizens United Case. The immediate abrogation, even if it requires a Constitutional Amendment, of the outrageous and anti-democratic holding in the “Citizens United” case proclaimed by the United States Supreme Court. This heinous decision equates the payment of money by corporations, wealthy individuals and unions to politicians with the exercise of protected free speech. We, the People, demand that this institutional bribery and corruption never again be deemed protected free speech. Yea. You pretty much beat this dead horse on point #1. As I recall, unions were not restricted by the Pelosi Progressive law that was ruled unconstitutional. Sorry, you can’t have only free speech that you agree with. Freedom has a down side, but the upside far outweighs the down. You are suffering from the “dead horse” syndrome and you are upsetting your PETA base. Can’t we just combine items 1,2 and 3 into one ridiculous anti free speech argument? 4. Term Limits. Members of the United States House of Representatives shall be limited to serving no more than four two-year terms in their lifetime. Members of the United States Senate shall be limited to serving no more than two six-year terms in their lifetime. The two-term limit for President shall remain unchanged. Serving as a member of Congress or as the President of the United States is one of the highest honors and privileges our culture can bestow. These positions of prominence in our society should be sought to serve one’s country and not provide a lifetime career designed to increase personal wealth and accumulate power for the sake of vanity. Term limits were not part of the founder’s plan. But the possibility of amending the Constitution was thankfully included, although they made it rather difficult. Which is a good thing. Term limits have merit. But there have been times where the dangled carrot of reelection has served to sway votes away from the politician’s personal ideological views ind towards votes more in line with the majority of voters in the home district. For example, many liberal US Senators won in 2006 and are presently up for reelection in 2012. Their home district moved to the left in 2006, but has moved back to the center, or the right now. The Senators must now decide to vote the will of the people they represent, or their own, more to the left personal feelings. A lame duck ideologue, left or right, is a dangerous thing. Presently, the left is on the short end of the stick here. But there are times the advantage has shifted against the right as well. I am not a fan of career politicians, but these days I fear the lame duck even more. They are no longer accountable to voters. Most Americans agree that we need a fair tax. But the difference in opinion we have here is that Progressives see tax rates approaching 100% on the wealthy as fair and 0% for the bottom 50% as fair. The idea that just because someone makes more money they should pay a larger percentage is not fair. They will pay more money than someone making less at the same percentage. A flat tax is both fair and equal. A progressive tax is, well, Progressive. Redistribute the wealth. This approach tends to create a permanent underclass with no ambition to better themselves and an upper income class unwilling to put their money that they earned back into play. That is what is happening now. This encourages corporations to move jobs offshore, and if we make a move to eliminate moving jobs, entire companies will be forced to move. The problem is not cheap labor abroad, it is expensive labor at home and a punitive tax system that is already overburdened. A fair tax would be one that everyone pays something. Half the citizens are not vested in America. But for Progressives, the 50% of Amrticans who are the dependent class will be more inclined to vote for Progressives lest their free ride be taken away and they have to find jobs. One of the most fundamental mechanisms with which people can be controlled is through their health (and life). Progressives are fully aware of this. If they control energy, the food supply and Health Care, we are powerless. This is not about healthcare, it is about full and absolute control of the people. Healthcare is so expensive due to the lawyers. These lawyers are protected by the Progressives. Without huge lawsuits the price of care and drugs would drop dramatically. Tort reform is a must. And competition. Medicare is broke. Social Security is broke. The government is $15 trillion in debt, though that is only a fraction of the true debt. What on God’s earth makes anyone believe that a government run single payer healthcare system is viable? All the compassion of the IRS and the efficiency of the Post Office rolled into an overburdened system with Progressives looking to bleed the job creating “wealthy” even more. If Americans knew what would happen in a government run healthcare system, they would run screaming. Seriously? With one stroke of a pen, some unelected and unaccountable bureaucrat with a political agenda could swoop in and destroy more jobs in a single day than the Obama administration has killed in 3 years. Global Warming has been exposed as a fraud perpetrated by Progressives to control energy. Remember? Control Energy, Food and Health and you own the people. Question. Which political party benefits most from oil money? And which party would benefit the most from the elimination of said money. 8. Debt Reduction. Adoption of an immediate plan to reduce the national debt to a sustainable percentage of GDP by 2020. Reduction of the national debt to be achieved by BOTH fair taxation and cuts in spending to corporations engaged in perpetual war for profit, the “healthcare” industry, the pharmaceutical industry, the communications industry, the oil and gas industry, and all other sectors that use the federal budget as their income stream. We agree that spending cuts are necessary but those cuts must be made to facilitate what is best for the People of the United States of America, not multinational and domestic corporations who currently have a stranglehold on all politicians in Washington, D.C. in both parties. You can’t cut the debt and kill jobs too. You advocate government provided healthcare which would be the biggest debt maker in the history of America. And you attack the industry that provides millions of jobs. They will take their jobs elsewhere. We have a serious debt problem, but encouraging those with money to invest works far better than punishing them. This idea will only lead to more debt and higher unemployment. 9. Jobs for All Americans. Passage of a comprehensive job and job-training act like the American Jobs Act to employ our citizens in jobs that are available with specialized training and by putting People to work now by repairing America’s crumbling infrastructure. We also recommend the establishment of an online international job exchange to match employers with skilled workers or employers willing to train workers in 21st century skills. In conjunction with a new jobs act, reinstitution of the Works Progress Administration and Civilian Conservation Corps or a similar emergency governmental agency tasked with creating new public works projects to provide jobs to the 46 million People living in poverty, the 9.1% unemployed and 10% underemployed. Public sector jobs cost money that we do not have. This is clearly an Obama agenda item here. You can’t put millions to work in government jobs on borrowed money and eliminate poverty and the debt. The private sector MUST thrive in order to provide these things. The government gets it’s money from taxing the private sector. What good does it do to add more workers to the government payroll? The “American Jobs Act” is nothing more than another union bailout designed to increase union dues that can be given to Progressive politicians. What happened to your first 3 points? Rather than waste more money hiring people we can’t pay without either printing or borrowing more money, how about a tax incentive to induce the private sector to create jobs with the same money? Open more spaces to oil and gas drilling. Instead of paying unemployment, these people could actually go to work and pay taxes. Public jobs COST tax dollars, private jobs PAY taxes. Why is that so hard? I would say that the massive student loan debt was caused by students attending overpriced colleges. Tenured professors making hundreds of thousands of dollars are not cheap. So let’s wipe out the student debt and add that to the national debt. Or better yet, make students completely unemployable by forcing employers to pay a trillion dollars for a kid they hire who will probably last a year or two at most. Or do we simply enslave the student as an indentured servant for 20 years, forcing him to work for the boss who paid his loans off. Are you aware that most employers pay for classes and training? More of the Progressive Obama agenda. It amazes me to see a document bemoaning the 46 million people living in poverty advocating bringing in more people to compete with the un and underemployed for the same few jobs. And we will also give them free healthcare and educations. Was the debt reduction an afterthought? America has no jobs and we are broke. We do not need more people and can’t support more people until we create more jobs. 12. Ending of Perpetual War for Profit. Recalling all military personnel at all non-essential bases and refocusing national defense goals to address threats posed by the geopolitics of the 21st century, including terrorism and limiting the large scale deployment of military forces to instances where Congressional approval has been granted to counter the Military Industrial Complex’s goal of perpetual war for profit. The annual estimated savings of one trillion dollars per year saved by updating our military posture will be applied to the social programs outlined herein to improve the quality of life for human beings rather than assisting corporations to make ever-increasing profits distributed to the top 1% of wealth owners. Finally. One out of 12 and we finally find something to agree on. Partly. War for profit? Please spare us the far left rhetoric. If Nancy Pelosi believes that unemployment creates jobs and you believe that the government paying for public employees is somehow a good thing, it is a bit hypocritical to attack “war for profit”. It would have been far better to simply leave out the ideological Progressive approved buzz words and just say end the wars that are not in America’s National DEFENSIVE interest. (Provide for the National Defense.) The Military Industrial Complex rhetoric is unnecessary. We are doing far more than the US Constitution allows and it should stop. We should defend the country and let other nations build – or rebuild – themselves. We are broke. But instead of spending the money on more social programs, let’s apply the trillion to the debt. That is the most serious issue facing America today. Again, we have some agreement on this. Eliminate tenure. Pay teachers a salary competitive with the private sector. Of course we would have to take the summer vacation into account. Most probably make as much or more than a private instructor given the pensions, benefits and ample vacation. We should eliminate many of the Administrative positions and stop the teachers from unionizing which puts the teacher in the position of putting their own interests above that of the children. And again, the places mentioned – China and India – don’t have cheap labor. American labor is overpriced and expensive due to regulations and tax burdens on corporations making the foreign labor markets more of a bargain. You really never hear the tech support people in India complain about low wages. They are happy to have a job and glad that America is forcing jobs overseas by placing too many burdens on American job providers. And I would also support teaching more carbon based research classes that could help America take advantage of our most abundant energy sources like coal, oil and gas. Developing ways to make these resources more efficient would help provide jobs. Green technology is decades away from being practical and we need to use what we have to provide energy and jobs until we develop other sources. 14. End Outsourcing. Subject to the elimination of corporate tax loopholes and exploited exemptions and deductions stated above, offering tax incentives to businesses to remain in the United States and hire our citizens rather than outsource jobs. An “outsourcing tax” should be introduced to discourage businesses from sending jobs overseas. Providing tax breaks to companies that invest in reconstructing the manufacturing capacity of the United States so that we again make everyday products in the United States rather than importing them from countries like China and India. Another area of agreement. However an outsourcing tax would serve only to convince corporations to move the entire company overseas. We need to compete on a level field, not by punitive taxation that will only make the goods and services we buy more expensive. Innovative ways to make companies want to keep their jobs here are what is needed. If these companies could make the product or provide the service here at the same price, or less, they would be happy to keep the jobs here. If you penalize them, they will leave. Most would support this. I am not a fan of the WTO as we would be subject to the same whims of this organization that is not exactly America friendly. 16. Banking and Securities Reform. Immediate reenactment of the Glass-Steagall Act and increased regulation of Wall Street and the financial industry by the SEC, FINRA and the other financial regulators. The immediate commencement of Justice Department criminal investigations into the Securities and Banking industry practices that led to the collapse of markets, $700 billion bail-out, and financial firm failures in 2007-2008. Introduction of a small financial transaction fee to collect a tax on each and every stock trade and all other forms of financial transactions. Uniform regulations limiting what banks may charge consumers for ATM fees, the use of debit cards and other miscellaneous “fees.” Ending the $4 billion a year “hedge fund loophole” which permits certain individuals engaged in financial transactions to evade graduated income tax rates by treating their income as capital gains which are taxed at a much lower tax rate (approximately 15%). There’s that over-regulation and punitive tax thing again. We need less regulation, not more. And by less regulation, I do not mean throwing out basic ground rules. They are healthy and necessary. The Progressive mindset is to micromanage. Fair rules that encourage free trade is far more effective than punitive taxation to stifle and throttle the exchange of money (or securities). And we need to keep Barney Frank’s fingers out of the Fannies and Freddy’s and Affordable Housing pockets. Frank alone had more to do with the market crash than any of the Wall Street villains you prefer to blame. And believe it or not, the so called “hedge fund loophole” actually encourages more investment than your idea to force investment income be treated as earned income would. The government probably collects more taxes on the greater number of transactions that occur when the income is taxed at the lower Cap Gains rates. They push the money back in as soon as they make it. Your solution would actually encourage them to sit on the money and take even more out of circulation. More government intervention and punitive micromanagement. Let’s just make the banks eat the bad loans that Barney Frank et. al. forced them to make. Remember when they started picketing the banks and even the homes of the bank executives to force them to loan money to unqualified borrowers? Do you really want to do that again? And yea another government bureau to put up roadblocks. More speed bumps on the road to recovery. This is simply a bad idea. 18. Ending the Fed. The immediate formation of a non-partisan commission, overseen by Congress, to audit and investigate the economic risks and possibility of eliminating the privately-owned Federal Reserve Bank and transferring its functions to the United States Treasury Department. The immediate one-year freeze on all foreclosures shall be implemented by an independent foreclosure task force appointed and overseen by Congress and the Executive Branch (in conjunction with the Consumer Financial Protection Bureau ) to determine, on a case-by-case basis, whether foreclosure proceedings should continue based on the circumstances of each homeowner and the propriety of the financial institution’s conduct when originating the loan. You won me over with the first sentence. “Ending the Fed.” Then you had to go and spoil it. Sometimes saying less is best. You want to trade the Fed and Ben Bernanke’s incompetence for the one man Washington who is even more incompetent – Timmy Geitner, the tax cheat. And again with the punitive actions on the banks. When you sign a mortgage note, you either make payments as agreed or the bank forecloses. It is a tough world and I do have sympathy for those unable to pay for their homes. But punishing the bank is not the answer. This is the Progressive redistribution of wealth. 19. Abolish the Electoral College, Comprehensive Campaign Finance and Election Reform . Subject to the above ban on all private money and gifts in politics, to enact additional campaign finance reform requiring new FCC regulations granting free air time to all candidates; total public campaign financing to all candidates who obtain sufficient petition signatures and/or votes to get on the ballot and participate in the primaries and/or electoral process; shortening the campaign season to three months; and allowing voting on weekends and holidays; issuance of free voter registration cards to all citizens who are eligible to vote so that they cannot be turned away at a polling station because they do not have a driver’s license or other form of identification; and expanding the option of mail-in ballots to all elections, especially for elderly and disabled voters. Abolishing the Electoral College in favor of the Popular Vote in presidential elections. I call this the Al Gore electoral bailout clause. Gore won the popular vote by appealing to inner city, densely populated dependent voters with no vested financial interest in America. When you look at the population maps for the 2004 election, about 90% of the map is red, 10% blue. Without the electoral college, all the Democrats have to do is concentrate on giving “stuff” to New York, California and a couple of other small geographical regions. The Electoral College was put in place to make voters concerns in Iowa and Idaho as important as those in Boston and New York. Democrats would garner a huge advantage, which is why the Progressives are pushing for this. And the rest of this actually mirrors #1, #2, and #3. Agreed. We are no longer at war and haven’t been since about 10 minutes after we started. We are nation building. In both places. As soon as Saddam was captured, we should have left Iraq. And we never needed boots on the ground in Afghanistan. A few drones can take out terrorist camps quite nicely. This gives me great hope that the Occupy Wall Street movement may actually be the salvation of America. It is my sincere hope and prayer that they are forced to enact this final paragraph. If they do run third party candidates, the Progressives will be purged once and for all from America. Well, at least until people forget how bad they really screw things up. Perhaps another 30 years. A third party run with this agenda will ensure that Conservatives are elected in huge majorities. And perhaps the TEA Party can then afford to field third party candidates in liberal RINO strongholds and rid America of Olympia Snowe and Susan Collins and people like Lindsay Graham. On this final paragraph of the Progressive punitive, job killing, budget busting, debt expanding manifesto we are in complete agreement. The TEA Party may actually be able to field a winning candidate in places like San Francisco with an OWS candidate and Pelosi in a 3 way race. The last section alone was worth the effort and tediousness of reading this ridiculous and massively misguided document. It is, however, my fervent hope that the people involved in Occupy Richmond, those I met on Friday, will be able to push aside the influence of the Progressives and unions that have infiltrated and taken over the Wall Street and other groups and produced the last two documents I have written about. As of now, I may not agree with Occupy Richmond completely, but I definitely respect them. I am able to muster no such respect with those who subscribe to the beliefs of the two latter documents. ← This is an AWESOME INTERVIEW with Cong. RON PAUL by the Editorial Board of the NASHUA TELEGRAPH!